Your Small Business Should Advertise in Print Media (But Not Newspapers) Mischa Communications, Inc. When was the last time you read a newspaper? No, not an online New York Times article your aunt shared on social media, but a real, physical newspaper — the kind that rustles in your hands and makes you turn to page six to continue reading the front page story. Chances are, it’s been a while. With the decline in newspaper subscriptions, it’s no wonder. Since 1990, circulation has decreased from 623 million weekly U.S. readers of physical newspapers to 346 million, and the numbers continue to fall. It’s not hard to see why. Once the internet became mainstream, newspapers fell to the wayside. Why should you don a robe and slippers at 6 a.m. to retrieve the morning paper from your flowerbed when you could just fire up your PC and scan the headlines at your leisure? The continued demise of the newspaper industry does not, however, mean that all print media is dead, or that you shouldn’t explore the advertising potential associated with it. Magazines, trade journals and other “niche” publications are still alive and well because there is an equally niche market that supports them. And there are plenty of benefits to sending some of your advertising dollars their way. Hit your target audience. Newspapers only report the news. They may throw in a few lifestyle pieces or review the newest nightspot, but the subject matter in your hometown paper is so broad that you may as well be tossing your ads to the wind and letting them fall where they may. Niche publications, however, bring your audience together. Everyone reading them is looking for the same thing. A magazine devoted to gardening caters specifically to gardeners — and if you sell fertilizer or flowers or seeds, advertising there likely will reach your customer base. Stay top of mind for longer. An online ad is there and gone in a flash. Even an email, as fantastic as it may be, either gets acted upon or deleted in a matter of seconds. Print publications, however, tend to stick around longer. The magazine containing your ad will sit on someone’s coffee table until they choose to get rid of it. They can pick it up and put it down at their leisure, or even clip out your coupon and stick it to their fridge. Print ads have a permanence that you can’t recreate online. Lend credibility to your small business. Someone who subscribes to a trade journal or magazine does so because they trust the information contained within and enjoy the subject matter. Be “fancy.” Ads in newsprint simply don’t pop the way they do in a glossy magazine. Full-color photos, exact reprints of your logo and the ability to customize fonts and sizes gives you plenty of room to play around and create something amazing. Newspapers aren’t dead, but they’re facing a long, likely terminal illness. Niche publications, however, are healthy as a horse. 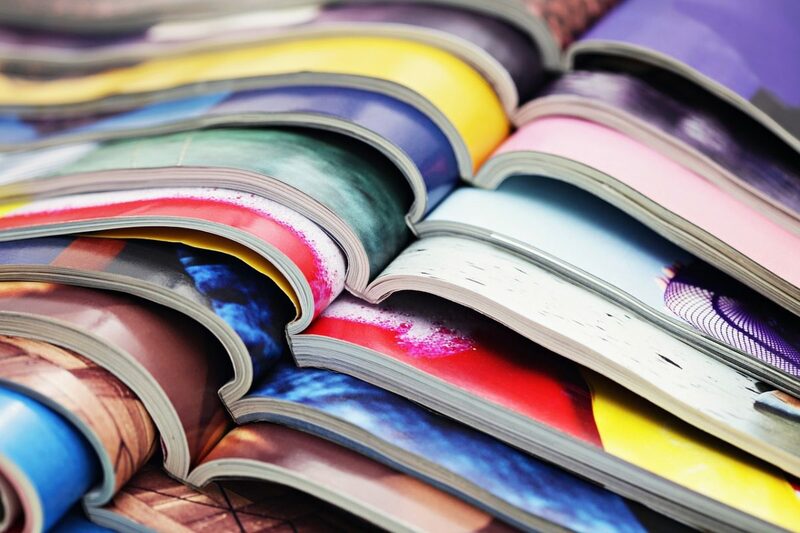 There is still plenty of value in print marketing — as long as you know where to look! Need help designing a killer advertisement for your favorite publication? Get in touch with us! The Mischa Communications team has everything you need to stand out in print media and beyond.